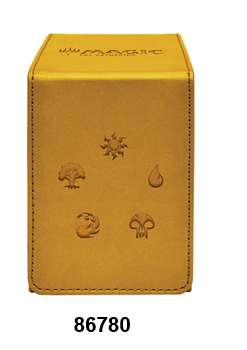 Give your valuable Magic: The Gathering collection the home it deserves with these premium Alcove Flip Box storage cases made with a matte leatherette finish featuring \"Island Mana\" symbol in dark blue from the popular trading card game. The Alcove Flip Box can hold up to 100 double sleeved cards with its lid secured by strong magnetic closures utilizing multiple magnets for extra protection. The lid can be undone on both sides of the box to reveal dual thumb notches for easy access to your deck of cards. The Alcove Flip Box is a great storage device for organizing and protecting your collection at home or on-the-go at your next gaming session!